We saw two of these stamps in our previous news articles. You can read them here. 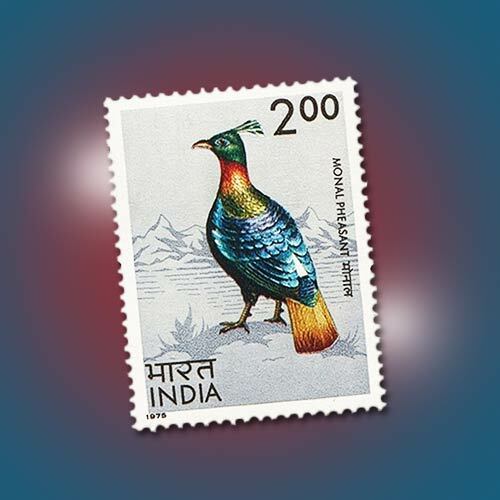 Now let’s see the last stamp of these series: Monal Pheasant: The state bird of Uttarakhand and the national bird of Nepal, Monal Pheasant is a bird endemic to the northern regions of India. The males have a stunningly colourful rainbow-like plumage while the female – like other pheasant females – is dull in colour. A highly communicative bird these Monals use several call types to express meaning to its mate or other birds in its foraging group, or intruding birds. Males also use body displays to attract females like bobbing their distinctive green head-crest and fanning their rainbow coloured tail feathers. Though found in abundance, constant poaching has created a concern for their decreasing numbers. This bird featured on a Rs.2 stamp was, until 2007, the official state bird of Himachal Pradesh.